Mary Anderson and Izzy roll in Bellingham. 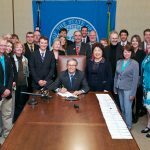 Bicycling is on the rise across Washington state, the nation, and the globe, across all ages, abilities, and ethnicities. All the indicators tell us that the future of transportation is increasingly two-wheeled. 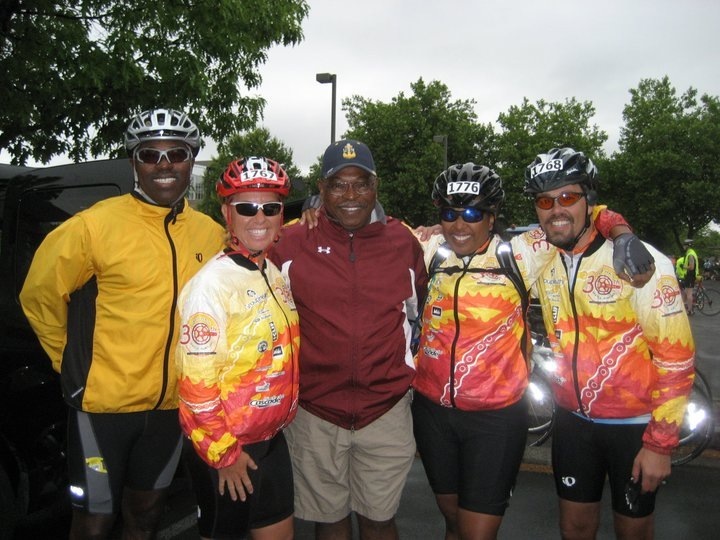 What originally served as our 2013 auction theme, “All Kinds of Riders for All Kinds of Reasons,” now describes both our ongoing commitment and the future of bicycling. The indicators below tell us more and more people are riding for more and more reasons, and that our hometowns are changing in ways that will encourage and accelerate growth in bicycling. Our list touches briefly on topics being written about in greater depth here and elsewhere and we haven’t captured everything. Tell us in the comments: What trends do you see that tell you bicycling is booming? 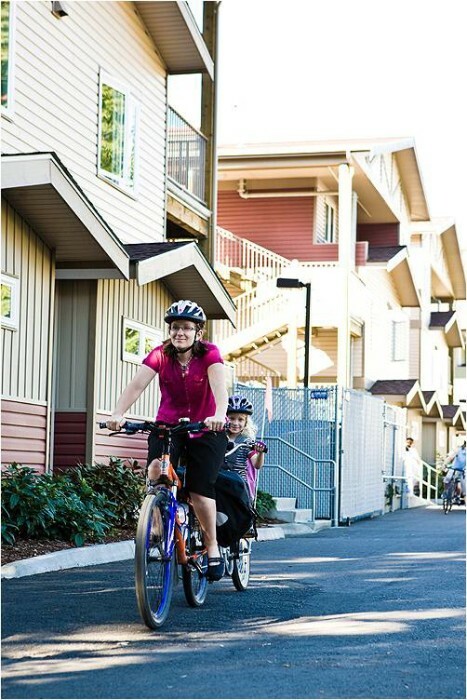 Reason #1 biking booming in WA/everywhere: #familybiking on the rise. Family biking is really rolling! 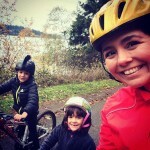 Washington state bike blogs like Family Ride and Car Free Days show how it’s done. The Seattle Family Biking group on Facebook shares tips and wonderful pictures. Kidical Mass rides take place from Spokane to Tacoma. 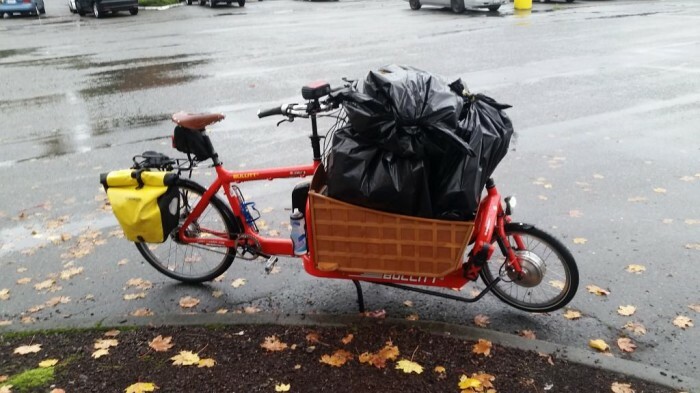 Reason #2 biking booming in WA/everywhere: Cargo bikes haul people and goods. Yes, you can make a Costco run by bike. Glen Buhlmann of Kirkland does it every week. Cargo bikes are big — as in, you can haul a lot by bike! You can buy the bicycle equivalent of a minivan with room for 2-3 kids and several bags of groceries. People move by bike (in fact, that’s one of the books we sell in our store) and go to Costco. Reason #3 biking booming in WA/everywhere: #womenbike growth. Spokane Valley #1! Women are riding in increasing numbers. And the #1 place in America for women commuting by bike, according to the League of American Bicyclists? The town of Spokane Valley. Biking is on the rise among people of all cultures and ethnicities. In fact, the most rapid increases in riding are among Latinos, blacks, and Asian Americans and the highest use is among Native Americans (“The New Majority: Pedaling Towards Equity” from the League of American Bicyclists lays out the data). In the next 3-4 decades these demographic groups will also become the majority in Washington state. Reason #5 biking booming in WA/everywhere: Biking=transpo independence for seniors. 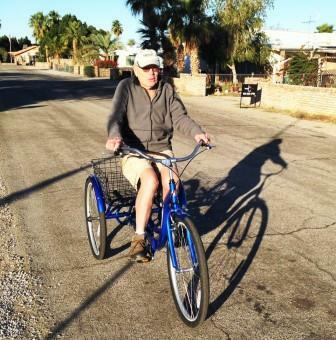 Senior cycling skyrocketing: New trips by senior citizens account for 22% of the growth in bicycling. Time to give up those car keys? Bicycling will help maintain health and transportation independence. Reason #6 biking booming in WA/everywhere: Young people riding more, driving less. Young people ride bikes, walk, take transit, use car-sharing: Young people (“young” in this case meaning 35 and under) are driving less and bicycling more. The Millennials are the biggest generation in human history. 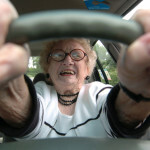 As a writer said in Motor Trends magazine, no less, they’re more likely to spend their money on cell phones and bikes than on cars, with the former giving them the social connections and freedom of movement that used to be attributed to driving. A Washington Post headline said they’re “shunning” cars. Put this shift in habits of consumption and transportation alongside accelerating trends in bike infrastructure and bikes themselves and there’s little reason to think they’ll all abandon bicycling when they turn 36. When they do drive it’s apt to be with a car-sharing service like Zipcar, which gives them the utility of a car for occasional use without the ongoing burden of ownership. Equity on the agenda: Bike advocacy leaders are working to address issues of privilege and inclusion to build a pro-bike movement of, for, and by everyone. I was privileged to participate as a speaker in the opening session when the League’s Future Bike initiative launched. Dr. Adonia Lugo heads the League’s equity initiative; she lived in Seattle while working on her PhD and we helped supported her research into bicycle justice. 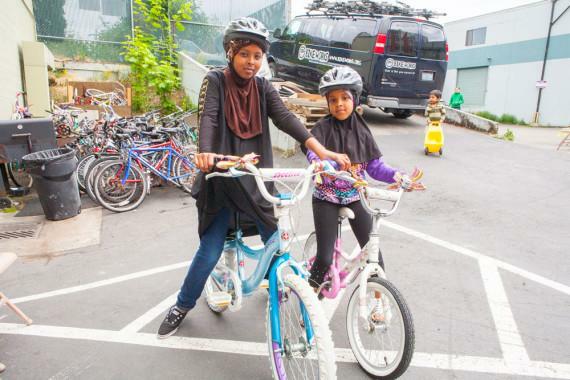 These girls at a Bike Works Kid Bike-O-Rama represent the future of bicycling. 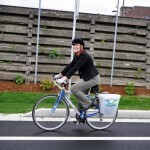 Reason #8 biking booming in WA/everywhere: Neighborhood activists demand safer, better streets. Neighborhood activism remaking streets: People are uniting in groups like Seattle Neighborhood Greenways, Kirkland Greenways, Yakima Bikes and Walks, and others to say that neighborhood streets with fast traffic and fatalities are unacceptable. Through traffic calming measures, street redesign, buffered bike lanes, and other changes aimed at creating streets for all, not just for drivers, cities are responding to pressure from these citizen groups to make safer and more livable streets for people. 20 Is Plenty: One of the tools for these changes is the move to slow speed limits in residential areas evident everywhere from London to New York City. Just a 5mph slowdown makes a dramatic difference in injuries and survivals, which is why groups from AAA to AARP to the Childhood Obesity Prevention Coalition to public health agencies supported the Neighborhood Safe Streets Bill we got enacted in 2013. Washington cities can now slow speeds on non-arterials without the expense of a traffic engineering study. As streets feel safer, more people bike and walk. Reason #10 biking booming in WA/everywhere: Places for people, not cars, taking off. Applying highway engineering methodologies when planning city streets predictably begets fast moving cars and all the charm of a highway. Many of the headlines about placemaking refer to walkability without mentioning bikeability. But any town focused on increasing foot traffic to its Main Street businesses and improving health in its neighborhoods will be redesigning streets to slow motor vehicles and encourage active transportation to replace driving alone, making conditions better for bicycling too. Walking and bicycling are distinct ways of getting around, each with its own needs, but when you see “walkable” think “walkable/bikeable” and you’ll recognize the improvements under way for all of us who use people-powered movement. As for this being a “trend”: We’ve been celebrating these types of places for a long time without labeling them. Every brochure you’ve ever seen that made you want to visit a place showed you slow-paced streets with lots of things to do inviting you to linger, not four-lane high-speed roads through a downtown core. Bikes mean business: Elly Blue’s book Bikenomics makes the case eloquently — people on bicycles return both direct and indirect benefit to local economies. With the rise of Bike-Friendly Business Districts, Bicycle-Friendly Communities found in all 50 states, and a growing interest in bike tourism as a tool for economic development particularly well suited for small towns and rural areas, our “wallets on wheels” are more welcome than ever. Your Turn: We got to 11 and didn’t even talk about health, the environment, or the affordable nature of bicycling in difficult economic times. What other trends should be on the list? Don’t fall behind: Sign up for our e-news to learn what’s happening for better bicycling, events in your area, legislative action and more. This article was posted in Accessibility, Advocacy, Complete Streets, Economic Impact, Encouragement, Equity, Family biking, Infrastructure, Issues & Advocacy, Kids, Legislature, News, Safe Routes to School, Safety, Seniors, Transportation, Women and tagged diversity. Bookmark the permalink. Follow comments with the RSS feed for this post. Both comments and trackbacks are closed. Woo-hoo! According to this blog post I’m still defined as young(for 6 more months at least). Keep up the great work.